This will be featured on RPS' DevLog watch. I'm calling it first. I'm loving the pixel art in this game. Still staring at the campfire. The enemies also look very engaging, looking forward to more from this! We would like to release on as many platforms as possible! But firstly we're aiming for Steam! We already have controller support and would love to see Eitr make it to consoles in the future. Any love for Mac users? Yes! There will be love for both Mac and possibly Linux as we're developing the game in Unity, exporting to both of these platforms shouldn't be an issue. Wow ! This is some wonderful art. Would love to see the walk and run cycles across a larger swath of environment. Looking forward to more updates. quite nice. the animations are superb. Thanks a lot Andreas, couldn't help but notice you work at Playdead, thats great! We can't wait for Inside! Looks amazing cant wait to see more! May I ask what engine your using? Thanks, sure! We're building the game in Unity. Whoa, surprising to me as it looks pure 2D to me (maybe I don't know what to look for). Are you using that new-ish version of Unity meant for 2D games I've heard about? Yeah it did, although some work has to go into getting it to actually look and stay pixel-perfect during camera movements etc, I think as time goes on we're going to see a lot more 2D games in Unity 3D, it really is a great engine. Love the art style and that the protagonist is a woman. 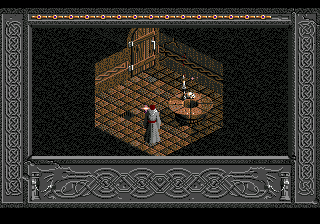 Also, the first screenshot somehow reminds me of Divine Divinity, which brought the nostalgic goosebumps. I need this game... Can i buy it in Early Access already? Looks very interesting, loving the dark hues. Thanks, had to look that game up as I didn't know what it was, pretty interested in trying it out for myself now actually! Reminds me of Baldur's Gate.